Every time I go to a store that has plantains I go crazy and buy way too many, this usually works out fine if the plantains are green because I have more time to use them and can start using them in dishes that are made with green plantains and then as they ripen use them in different ways. However when my plantain shopping spree includes only ripe plantains I have to use them a lot faster, this all started when I bought a bunch of ripe plantains for a New Year’s party and because I had so many dishes already planned I ended up making less fried ripe plantains than I expected, so back in mid-January I thought it would be a good idea to make a puree with the ripe plantains. 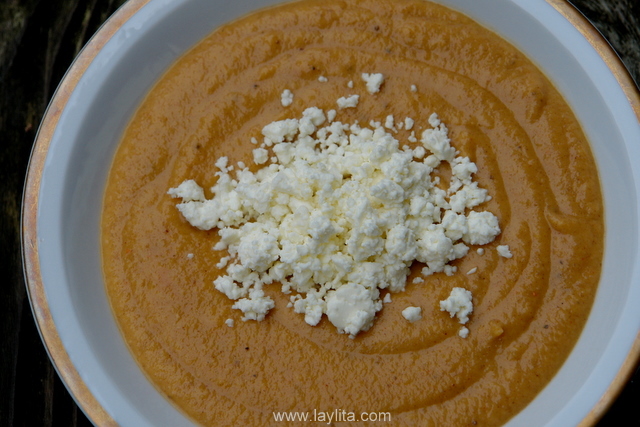 My first attempt to make the puree was very experimental and turned out okay but not great; the second time was much more successful and I was able to change or work with the issues I had the first time I made this plantain puree. I realized that since the plantains were much starchier that potatoes they need a lot more liquid (water and milk) to obtain a smooth consistency. 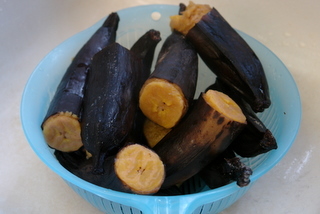 Also these very ripe black skinned plantains are very sweet so in order to make this work as a non-dessert dish I needed to add spices and seasonings that would compliment and offset the sweetness; to do this I made a refrito (a base for dishes that consists of sautéing onions, garlic, spices and sometimes other vegetables in oil or butter) with onion, garlic, cumin, achiote or annatto powder, and chili powder. On my first try I pureed the ingredients using the food processor and it left the puree a little bit chunky so next time I used a blender and it worked a lot better. 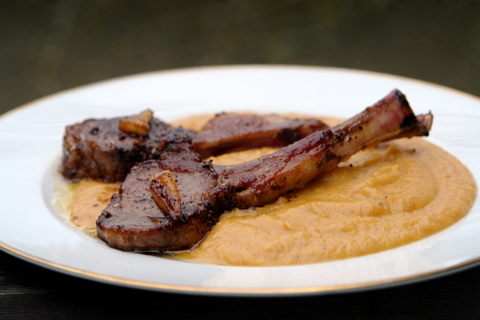 This ripe plantain puree works great as a side dish for meat entrees, I especially love the way it goes with lamb chops. 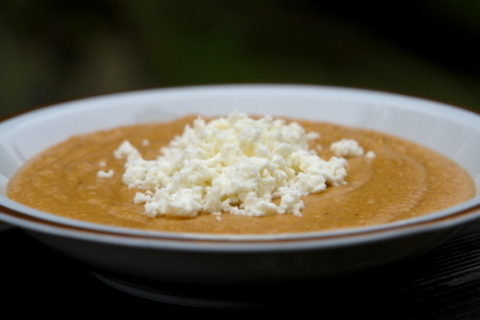 Since I had a lot of it I also tried it as an appetizer or soup, in that case I suggest topping with your choice of crumbled queso or feta cheese, or sautéed bacon bits or chorizo, also caramelized onions are another great topping. 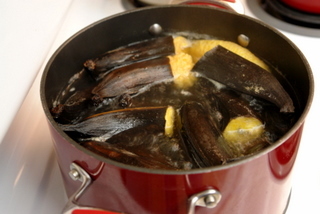 Boil the plantains for 30 minutes. Let me them cool down until safe to handle. 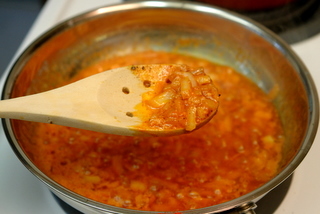 Meanwhile prepare a refrito, heat the butter over medium heat, add the onions, garlic and spices, cook for about 5 minutes or until the onions are soft. 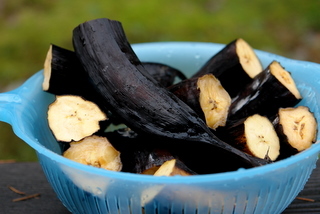 Peel the boiled ripe plantains. 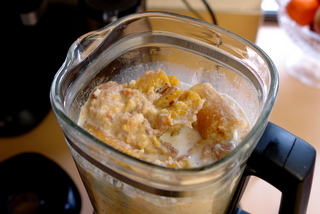 Working in batches, put the plantains, water, milk and refrito in a blender and mix until a smooth puree is obtained. Serve as a side dish for meat dishes, can also be served alone with crumbled cheese, sautéed bacon, chorizo or caramelized onions as toppings. Lyilita, Love, love your recipes. Visited Ecuador a long time ago working on contract with Pan American Union. As an elderly widow I just dream I could visit again this wonderful country. About your Plantain Recipes, In Puerto Rico we use them a lot. 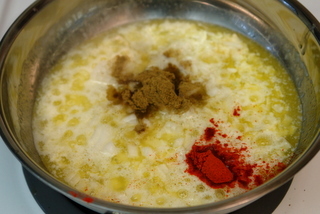 With the green plantain, we make Mofongo- fried and crushed , A very typical and well know way to make it is called MOFONGO RELLENO, placed and served in a Mortar to make a concave shape, and stuff with shrimps or other sea food. I prefer the ripe ones. We make them in many different ways. 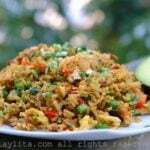 Besides stuffing with cheese, we also do it with Picadillo (seasoned and cooked ground meat). We make PIONONOS- sliced, fried, make a round form, fill with Picadillo and cheese, with egg batter on both sides and seal on skillet. Personally, I use muffing pans, and bake them. We also make PIÑON – a baking dish like lasagna, with battered eggs,layers of sliced and fried ripe plantains, seasoned and cooked ground meat, green beans and cheese. Bake it . Very good. You should try these sometime. I keep following your recipes and share them at Pinterest. Since you buy so many ripe plantains at the same time, you could freeze this puree in an ice cube tray to store longer. Never would have thought of this! Sounds delicious. Thank you! I love the flavor of this. 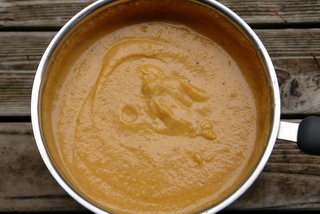 I’ve made it a couple of times and have found that it’s more like a soup than a side with the recommended amount of water, so usually use only 2 – 3 cups total. It is great as a soup, too, though. I’ve been a fan of your recipes and your website for a few months now! Congratulations, loving every bit of it! 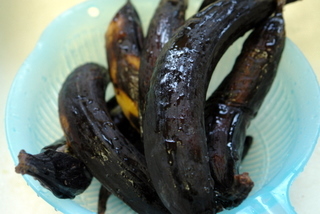 About this recipe and as a plantain fanatic, DELICIOUS! excellent alternative as an accompaniment! Made it with grilled ecuadorian Mahi Mahi, perfect ! Rosa – Thank you, I hope you enjoy it. 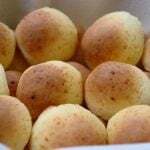 Paz – You are welcome, I was thinking of you when I posted the recipe! Todd – Plantains are very addictive, soon you’ll be joining Paz and me in our plantain obssesion. Anticiplate – Thank you, I really like the changes you’ve made on your site. I love the progression on these pictures!